It seems appropriate to begin our study by starting with the background – to look at context, culture, and what was happening in the world. We learned from Titus that right doctrine rightly applied produces right living. As we make our way through Colossians, we will encounter echoes of this same truth, but from a different angle. Knowledge of God is important. No it’s vital. Your view of God, your understanding of who God is, ultimately is the only thing that matters. Because what you know of Him shapes what you believe and then how you feel and finally how you act. Fortunately God does not leave us in the dark concerning who He is! He, the eternal Creator, makes Himself known to us, the limited, finite created ones. He reveals Himself to us through His creation, but most presently and intimately through HIS SON. Ahh, here’s where our letter speaks most loudly! Colossians is said to have a profoundly high view of Christ. Perhaps this is exactly the kind of letter we need to read today. Let us settle in and get reacquainted with Christ, the supreme and sufficient Savior! Paul, an apostle of Christ Jesus by the will of God, and Timothy our brother, 2 To the saints and faithful brothers in Christ at Colossae: Grace to you and peace from God our Father. Please meet my new friends, the Colossians. Even though Paul is the first character mentioned, then Timothy, I’m actually going to discuss the Colossians first. 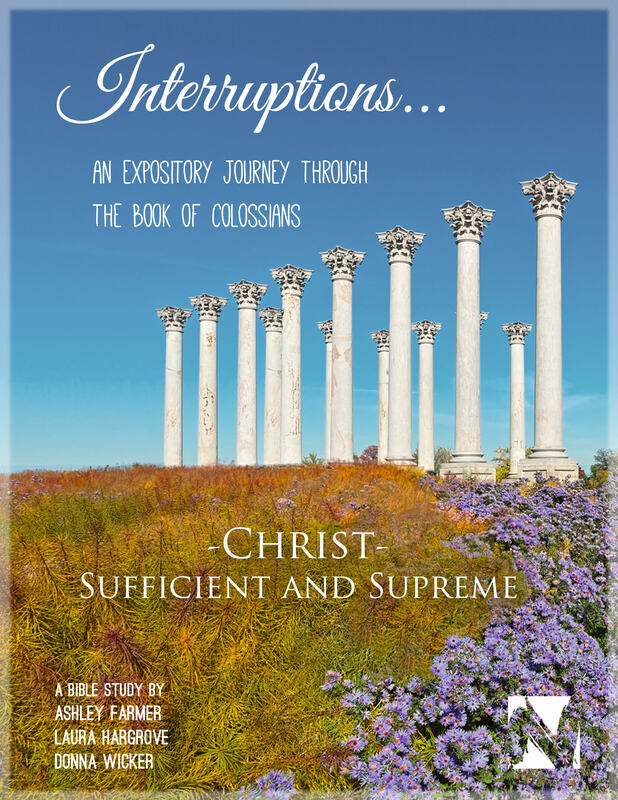 You may be wondering what is so special about Colossae. To tell you the truth, nothing. It was said to be the least important church of the New Testament. In fact Lightfoot writes, “without doubt Colossae was the least important church to which any epistle of St. Paul is addressed.” (Word Comm p. 2) But don’t you just love that Paul wrote to them anyway? The church is still the Church no matter how small. Let us begin with a geography lesson! It was a thriving city in the 5th century B.C. 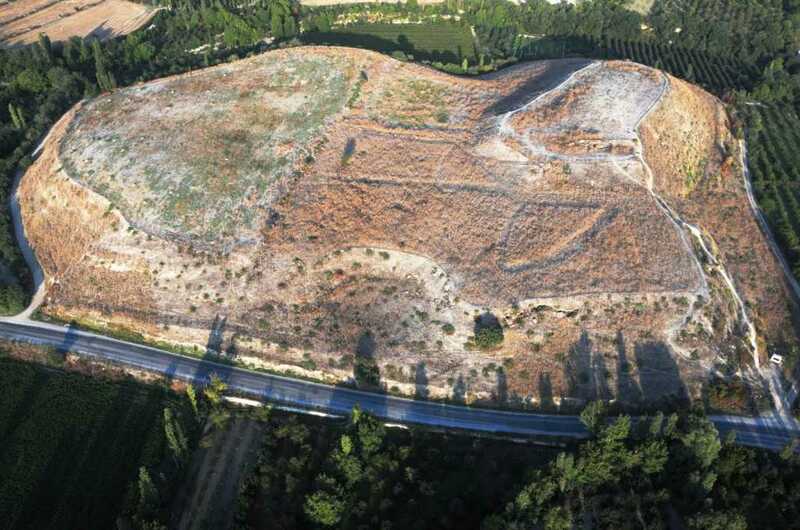 (think Esther and the Persian King Xerxes) but had declined by the time Paul was on the scene because the major trade roads that once carved through Colossae began to bypass the town for the neighboring cities like Laodicea and Hierapolis. 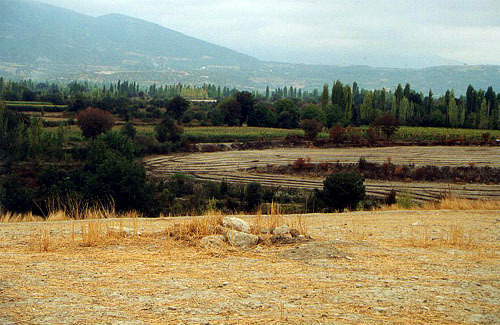 It is believed that Colossae was initially made wealthy due to the textile industry, and the city was known for its wool and black and red dyes which came from the nearby chalk deposits (Strabo in Word; MacArthur). 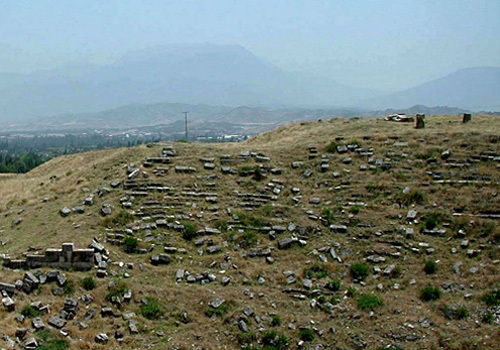 Unfortunately we know only a tiny amount about the ancient city of Colossae due to the fact that it has never been excavated. Here are some images of the land as it stands currently. Sometime after 61 A.D., a massive earthquake destroyed the tri-city area (according to Eusebius it was 64 A.D. and Tacitus claims it was 61 A.D.). A well-documented fact of Colossian history was that the Lycus river, beginning at Colossae, disappeared underground for about 1/2 mile. In the area where the underground course was believed to run is now a ~30′ deep canyon. It is believed this canyon was formed by collapsing of earth caused by the AD 60 earthquake . This may help explain the existence of cold springs in the area; for if the Lycus flowed several hundred yards beneath the surface, it would have emerged cold. And although the 60 AD earthquake may have rendered the underground Lycus course extinct, it’s clear that underground water activity was not uncommon. 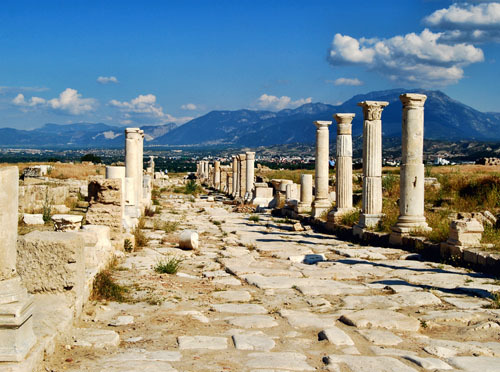 What is most interesting about this Colossian fact can only be realized if you see a map of the area and understand a little bit about the neighboring towns of Hierapolis and Laodicea. 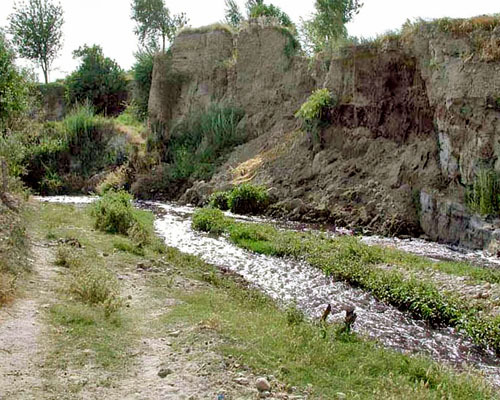 The rivers naturally ran toward the sea which was off to the west. 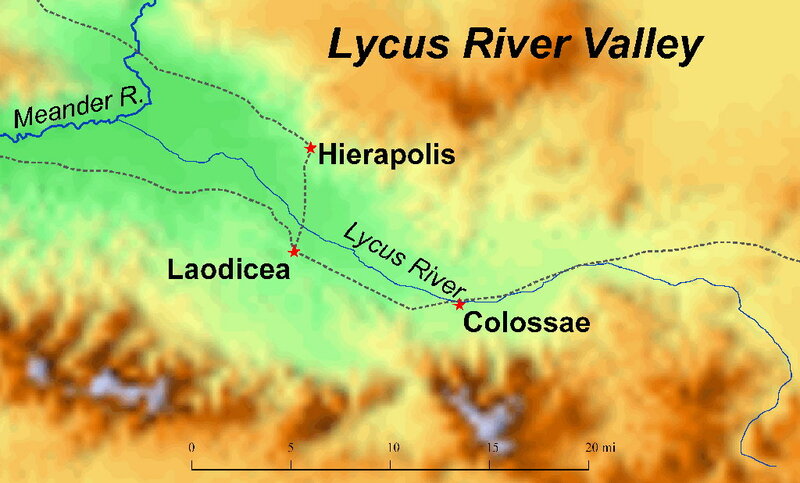 This means that the Lycus River at Colossae ran to Laodicea. Hierapolis, their neighbor to the north, remains famous even today for it’s hot springs. 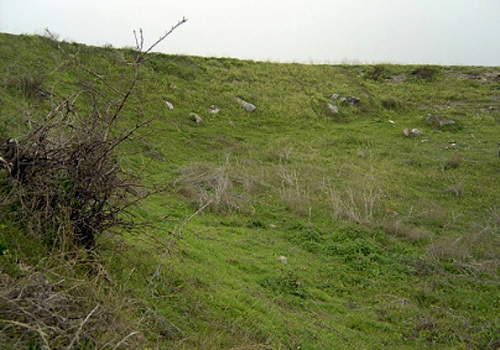 These hot springs would run south to Laodicea where they would mix with the cold water from the Lycus River. 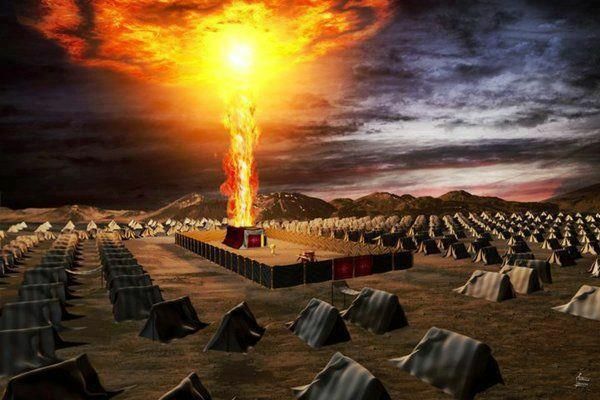 This helps explain Jesus’ “neither cold nor hot” remarks about Laodicea, which was sandwiched approximately between its two sister cities (Rev 3:16). 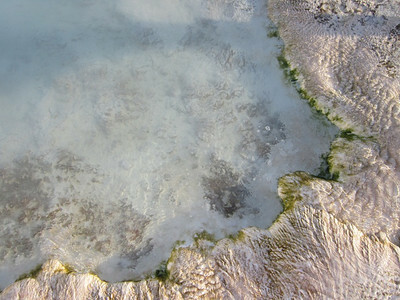 Interestingly, the cold water of Colossae was extremely beneficial as a refreshing drink or to help soothe a fever. Likewise the hot water of Hierapolis was used to help relieve sore muscle aches as it had healing properties at such high temperatures. This is why Jesus wanted Laodicea to be either hot (therapeutic benefits) or cold (refreshing benefits) but not lukewarm. 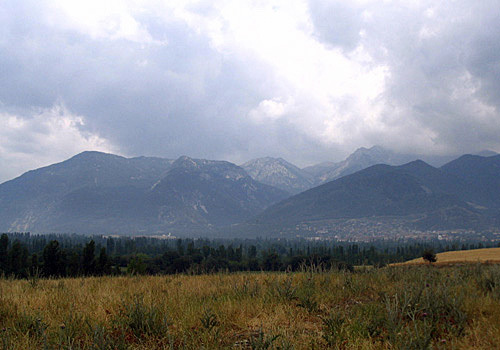 The majority of the people at Colossae were most likely Gentiles. 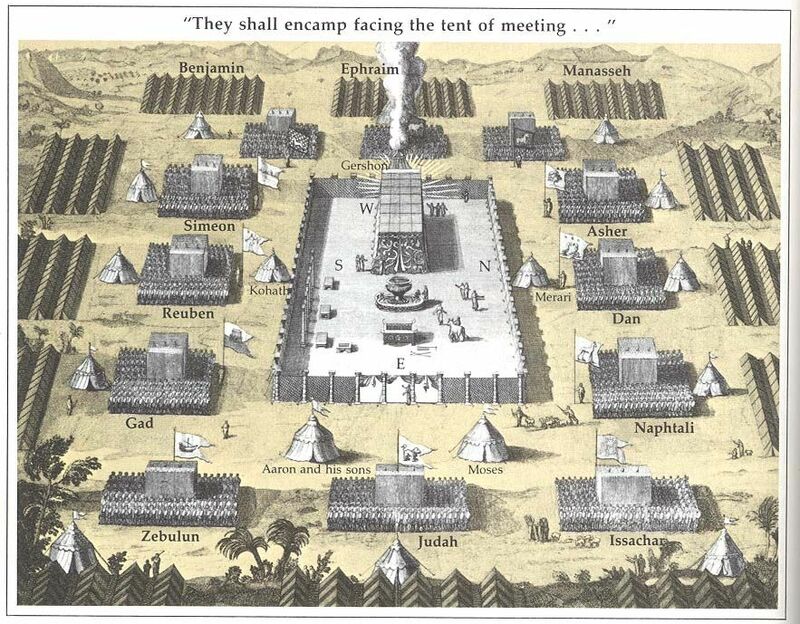 However Josephus describes a movement from Babylon of about 2,000 Jewish families into the area of Colossae during the days of Antiochus the Great (223-187 B.C. – 1st century B.C. ; Ant. XII 6.4). A near lack of references to the issue of reconciliation between Jews and Gentiles in the congregation (noting 3:11, 4:11). The congregation was said to be full of new believers (but honestly, most churches were new if you think about it! ), and we might assume that they either were experiencing some uncertainty in their faith due to outside pressures OR were needing more instruction in the truth of the gospel in order to buffer the outside pressure. In other words, they either needed correction or encouragement (or perhaps both). We must not be quick to assume that they had gone astray though because Paul’s tone does not seem to be harsh (as in Galatians for example). 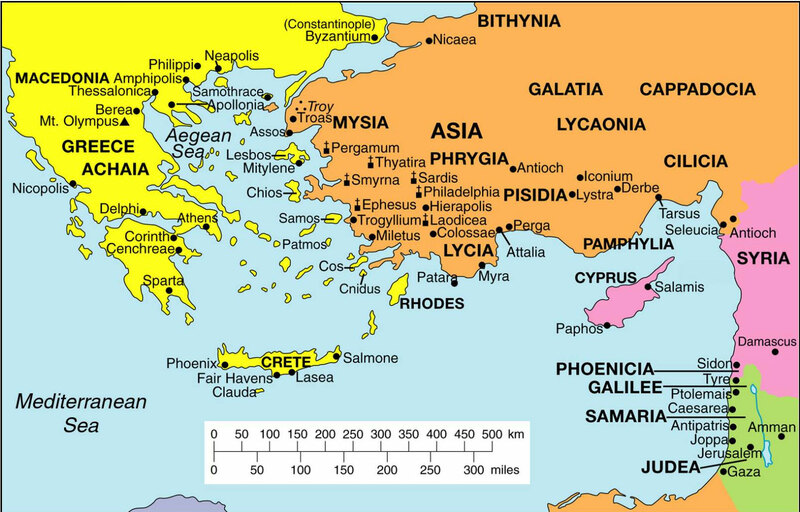 I mentioned that Colossae was in the region known as Phrygia, a Roman province. 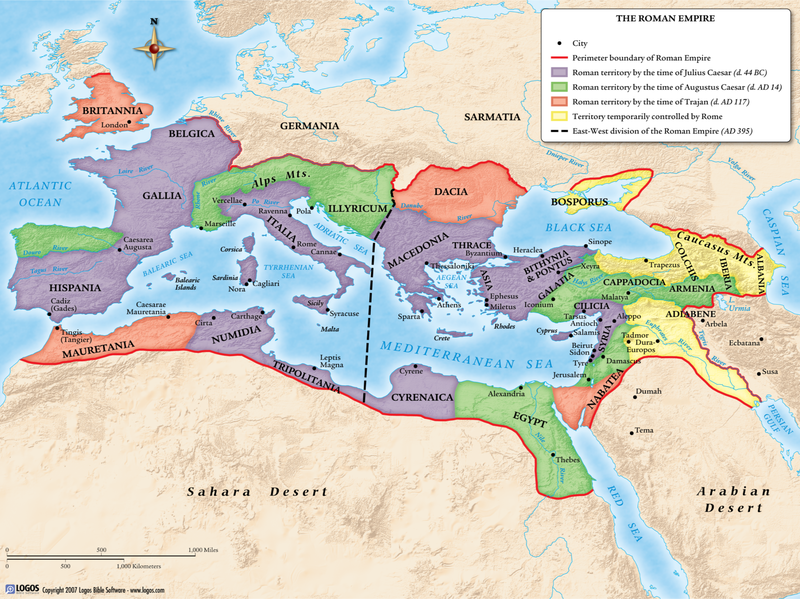 Here is a map showing the entirety of the Roman Empire. With the exception of the orange and yellow, this is how widespread the empire was during Paul’s time. It stretched from England to India. And just to give you an idea of Rome’s dominance, they ruled over this area (give or take a few regions) for 1500 years! To give you an idea of how incredible this is, our country is a little over 240 years old. The reason Rome is important to our study is that we can know some defining characteristics of the culture in Colossae and the surrounding regions. We will be talking about the Persians sometime in the near future, and like the Persians, the Romans had a lust for power. They had conquest ingrained in their bones. However, unlike the Persians, they did not rule with an iron fist per se. They allowed more freedom under the law, and this resulted in a fairly long lasting sense of peace throughout the empire. The Romans had a definite philosophy on what made a country great. Naturally they would espouse their views as the “best” way of living. 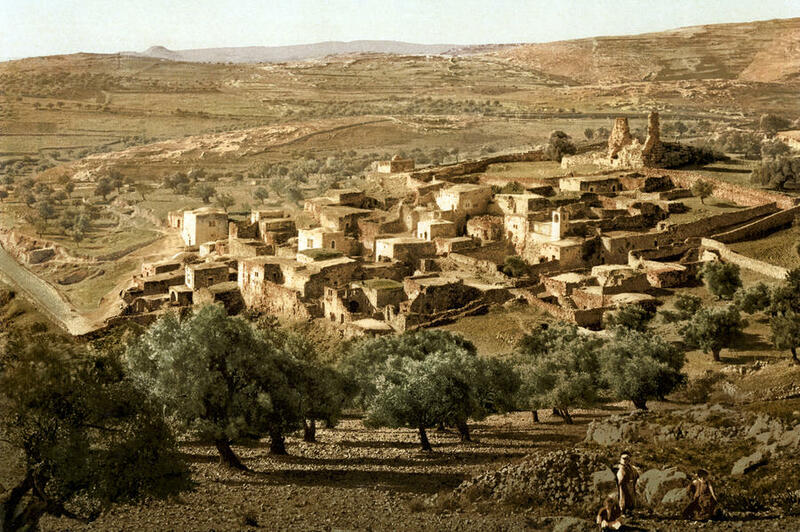 They essentially believed the Roman way was “the way.” Interestingly, there were several factors that made the spread of the gospel much easier during the Roman rule. Political unity produced economic and political stability as well as encouraging trade between cities and regions. 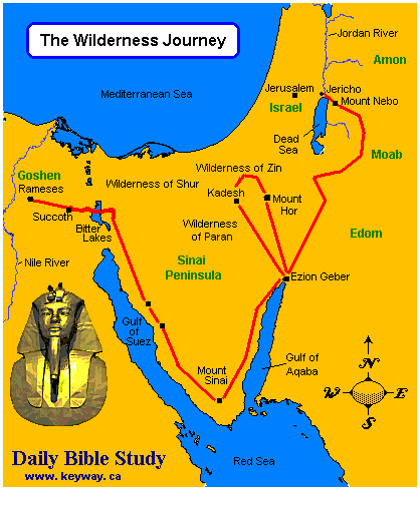 Military and trade routes meant easy access to large numbers of people. Greek was the universal language and made communication easier between regions. The mixing of cultures allowed for easier cross-cultural evangelism. However, as great as Rome was, there was also a blending of religions. It was very easy to hold 1) syncretistic beliefs during this time because the Romans had so many gods (just like the Greeks) and did not hold to a monotheistic framework. What was one more god going to hurt? I’ll just add Jesus to my repertoire. They were polytheistic and inclusive. Just imagine what the culture was like for the Colossians. Grab a little of that faith, a little of this one, sprinkle some of that one, and viola, I think I’ve figured out the best concoction to be fully spiritual. The letter specifically says, “Paul, an apostle of Christ Jesus…and Timothy our brother…” It would make sense then that the author is Paul, right? Scholars note that just because the letter begins with Paul’s name does not necessarily indicate true authorship. There is evidence that people in the first century wrote letters using Paul’s name to lend credence to their words. I personally think that Paul wrote the letter, HOWEVER some scholars have questioned the Pauline authorship of Colossians. Yet a greater amount of evidence points to Paul as the author. The style is said to be different from that of the apostle. They believe that some of the word choices are not typical of Paul and that the construction of the letter carries a certain heaviness that feels different from a genuine Pauline letter. To answer this objection, it is not uncommon for a person’s vocabulary to change over time, especially when dealing with the specific circumstances at Colossae. In addition his choice of “new” words (not used in other letters) is not proof that he did not write the letter. He also uses different words in the letter to the Romans, but no one questions the authenticity of that letter! The difference in his vocabulary is more likely due to his subject matter. It is believed that the Christology (theology) of this letter is un-Pauline and conflicts with the representation of Paul in his other writings. To address this objection: There is no reason to believe that Paul could not have more fully developed his view of Christ (Christology). Nothing in his Christology actually conflicts with other Pauline passages on this matter (Rom 8:19-22; 1 Cor 8:6; 2 Cor 4:4; Phil 2:5-11). In other words, when the beginning sentence claims it was written by “Paul, an apostle…” the people believed it was from Paul! I agree that we don’t need to make too much of this extra author because we honestly can’t know if he wrote any of the letter. He is mentioned in the greeting in three other letters – Philippians, and 1 and 2 Thessalonians. It’s possible that he was present with Paul and showed the same concern for this little church. I just love that it shows that cycle of missions at work – he’s like Paul’s apprentice. And also because if it were much later, then Paul couldn’t have written it (because he was said to be in Rome after 60 A.D. and according to tradition, died in Rome). This line of thinking leans toward an Ephesian imprisonment but does not entirely rule out the Roman imprisonment. There are four Prison Epistles: Ephesians, Philippians, Colossians, and Philemon. Most people group Colossians with Philemon because the greetings in each letter are sent from practically the same people (Phile 23; Col 1:7; 4:12-19). In fact the two letters have eight of the nine names in common. Philemon 12 tells us that Tychicus (who is mentioned in Col 4:7) had Onesimus as his companion on the journey to the Lycus Valley. Interestingly, though Paul is the author of this letter, there is no evidence that he was ever in Colossae. 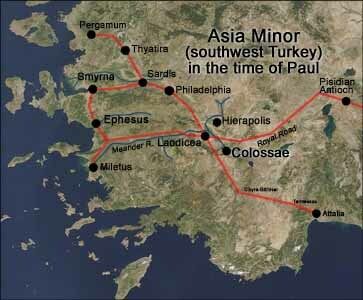 Paul passed through the region of Phrygia twice, once at the start of his second journey and again at the beginning of his third journey (Acts 16:6, 18:23). However he did not even come close to the city of Colossae the first time, and if he did the second time, he certainly did not found the church there (since he says in Col 2:1 that they had never seen his face before). As in every letter, it is best to look at the overall picture before plunging into the details. This is why I believe in reading the letter in its entirety when you first begin a bible study of any New Testament letter. One of the first questions I like to ask is: why was this letter written? You see how he speaks to the false teaching by expounding on sound teaching (theology) in Col 1 and 2, giving them the resources they would need to fend off these opponents. The letter to the Colossians is best known for its major emphasis on Christology, or the summing up of all things in Christ. Many have questioned whether this high view even jives with the other books of the NT. Can they possibly be wondering if Paul declares too high of view of Christ? I just don’t see how this is a problem! Perhaps this illustration about me and my sister will help me make my point more clear. I have a sister who is over three years younger than me. She is taller, has darker, curlier hair, and darker skin. She has the most amazing dark eyes with the darkest eye lashes which everyone always envies about her! She is beautiful and funny and talented. One of my favorite things that everyone asks is, are you two twins? Ha! Yes, I’ll take that compliment. We look similar though I’ve just explained to you how different we are. But as different as we are in appearance, we are worlds apart in our interests and preferences. She is a musician, I couldn’t tell you the difference between G and A. She went through a “goth” period with the dark, colorful hair and nails, I have never even dyed my hair (highlights yes..). She loves horror flicks and Halloween, I get scared watching Jurassic Park (The raptor scene!!! it’s terrifying people!). If someone were to write a letter to her about how to handle a troubling situation, it would sound very different from how a letter to me might sound. The message will ultimately be the same, but you’ll find very distinct emphases because not only are we different people but what would be troubling to her might be different from what would trouble me. Yet at the end of the day, my sister and I aren’t so different. I still need Jesus just like she needs Jesus. Louis Berkhof writes “the Christology of this letter is in perfect harmony with that of previous Epistles, but there is a difference of emphasis.” Paul emphasizes the significant impact Christ makes not only on the Church but on the whole Cosmos or creation. “All things were created by Him and find the purpose of their existence in Him.” Word Commentary notes that the specific conditions at Colossae necessitated the need for this high view. I would go further to say that WE ALL need this high view of Christ. Many have said that the letter to the Colossians is the twin letter of Ephesians. Berkhof notes that of the 155 verses in Ephesians, 78 find parallels in Colossians. As you read in the intro, Ephesians focuses on ecclesiology (study of the church) whereas Colossians focuses on Christology. So now you may ask, what exactly was the Colossian heresy? What was the threat of false teaching? Who was it that was threatening this congregation? My personal preference when dealing with unclear passages or issues in a passage is to take a look at how Scripture, and to be more specific, how Paul handles the truth in the letter in order to combat any external pressures. It also just so happens that knowing a little about the culture and history can inform our view as well. I will not go into great detail concerning the WHO because we will deal with the opponents as the passage progresses. So how does Paul handle these opponents? Well he warns the Colossians to be on their guard (2:8) because these opponents would try to ensnare them “by philosophy and empty deceit” (2:8). But he also mentions “human traditions” that are set up against Christ (2:8). Finally there seems to be a Jewish edge to these opponents which you will find in 2:16-19. This means that the opponents were not wolves disguised in sheep’s clothing, lurking in and among the church members, but rather were most likely outsiders pressing in on the Colossian church. To be clear, they were still wolves, but not those who had infiltrated the church as we saw in Titus. In his letter, Paul also uses slogans or catch words of the opponents but turns them on their heads by using different definitions to more accurately reflect the truth. For example he uses the phrase “all the fullness” (2:9), which was likely a catchword used by the opponents (based on studies of word usage in the NT and early Greek writings). Moo notes, “Paul’s use of this ‘fullness’ suggests that the false teachers were claiming to offer a “fullness” of spiritual experience that could not be found through Christ alone.52” (Pillar) So as to highjack and therefore baptize the slogan, Paul applies this title to Jesus and not to whatever “fullness” the opponents were focusing on. This spiritual program they followed caused them to separate themselves from finding the true source of spiritual power which is Christ alone. 4 though I myself have reason for confidence in the flesh also. If anyone else thinks he has reason for confidence in the flesh, I have more:5 circumcised on the eighth day, of the people of Israel, of the tribe of Benjamin, a Hebrew of Hebrews; as to the law, a Pharisee; 6 as to zeal, a persecutor of the church; as to righteousness under the law, blameless. If there was anyone who would be considered godly (to have spiritual fullness), it was Paul. One thing that I’ve read over and over again is that the Jews did not proselytize. They did not go out and make disciples of other nations. But Christ chose Saul, later to be known as Paul, to lead His church, becoming the apostle to the Gentiles! And think about how incredibly suited or qualified he was to be able to preach to the Jews. He knew the Law backwards and front (Napoleon Dynamite reference! BAM!). He was able, from his vast training in the Hebrew culture and Scripture, to explain to the Gentiles (and Jews) how Jesus was the fulfillment of all the Scriptures. He was also able to see that, as great as the Law was, it could not do what Christ did. (Rom 8:3 “For what the Law could not do, weak as it was through the flesh, God did: sending His own Son in the likeness of sinful flesh and as an offering for sin, He condemned sin in the flesh.”) How perfect then was it for God to choose Paul who would be able to refute any opponents to the gospel of Christ! Surely these opponents would have shaken them enough to cause them to question their salvation and their Savior. Are we really qualified to share in the “inheritance of the saints in light” (1:12)? Do we really have forgiveness of our sins (1:14; 2:13-14)? Are we really “holy and blameless and above reproach before him” (1:22)? Could these philosophies and human traditions really help us to attain to the Godward life? (1:22-23, 2:8) Can we really have “full assurance of understanding and the knowledge of God’s mystery” (2:2)? How can we, being dead in our sins, be made alive (2:13)? More importantly, how did the opponents cause them to doubt Christ? Was He really God (1:15, 19; 2:9)? Is He really as important as we’ve been told (1:15-20)? Could Christ really cancel the record of debt against me (2:14)? Or would the law do this (2:8, 17, 23)? Was Christ’s death also for me, a Gentile (2:11-15; 3:11)? Is Christ really supreme? Is He really sufficient? There is truly nothing new under the sun. Paul and the Colossians had to deal with opponents to the gospel, and we are no different today. 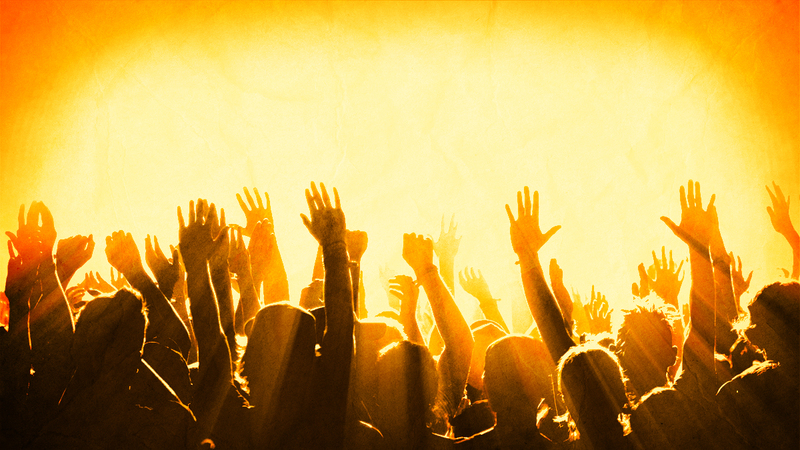 What philosophies do we buy into which claim to have the answer to all our spiritual woes? 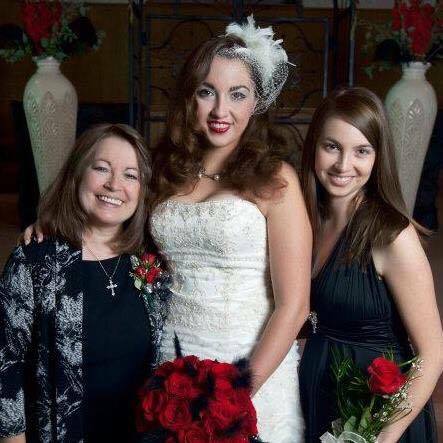 What tried and true traditions are we told to follow in order to be truly godly? So you’ve tried praying, and you aren’t getting the answers you hoped for… have you tried ______? You don’t like the direction your marriage is heading in…have you tried ______? You are unsure how to handle those unruly children…have you tried ______? Scared about the future of the nation? Worried about your job? Anxious about family relationships? Struggling with sin? Let Paul paint you a picture of your Savior. The Messiah. The Head of the Church. The risen One! The One who is our Peace. Our Hope of Glory. Our Victory over sin and death! The King on His throne. Christ, who is our Life. No, Christ sufficient and supreme! The only One you need.